On June 15, 2018, the National Philharmonic Orchestra of Russia has started another series of recordings. 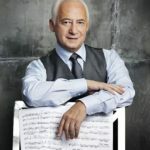 Vladimir Spivakov is resuming his recordings of preeminent works of Russian music: within eight days there will be captured his interpretations of Scriabin's Le Poème de l'extase, the Suite from Stravinsky's Le baiser de la fée, Rimsky-Korsakov's Scheherazade Symphonic Suite. They all will be released under the Maestro's own label Spivakov Sound. In addition, a separate album will present the NPR's new program titled Treasures and Rarities of Bel Canto, first rendered on June 8 at the “Vladimir Spivakov invites ...” Festival Edition in Perm and dedicated to the memory of Dmitry Hvorostovsky. Baritone Vasily Ladyuk, the soloist of the Kolobov “Novaya Opera” Theatre, the NPR's soloists Kirill Soldatov (trumpet) and Andrey Mikhailovsky (clarinet) took part in it. The program includes overtures and arias from operas by Bellini (Norma, I Puritani, Il Pirata), Donizetti (Dom Sébastien, Don Pasquale, Lucia di Lammermoor, L'elisir d'amore, La favorita, Il duca d'Alba) and Rossini (Il barbiere di Siviglia, Guillaume Tell ), as well as the virtuoso concert variations by Arban and Bassi on themes from popular operas. As before the recording is made with the participation of German sound engineer and producer Philipp Nedel, a Grammy and ECHO award winner, a permanent partner of such recorded music companies as Decca, Deutsche Grammophon, EMI, Sony Music and Onyx. 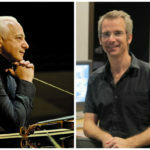 In 2015-2017 Nedel and his b-sharp company took part in the NPR's release of an Edvard Grieg music album titled A Wounded Heart (Sony Music) (it can be heard in the “Audio Section”), as well as in the recordings of the Holy Russia album (Spivakov Sound), some works by Russian and European classics and Tchaikovsky's Eugene Onegin opera. On June 17, 2017, the National Philharmonic Orchestra of Russia started a recording session of famous concert masterpieces to be released under the “Spivakov Sound” label. During eight days to follow there will be recorded works of Tchaikovsky (Piano Concerto No. 1), Rachmaninoff (Piano Concerto No. 2, Symphony No. 2), Prokofiev (Piano Concerto No. 3), Wieniawski (Violin Concerto No. 2), Bruch (Violin Concerto No. 1), Saint-Saëns (Introduction & Rondo Capriccioso) and Sarasate (Gypsy Airs), conducted by Vladimir Spivakov. Soloists – Alexander Malofeev (piano) and Clara-Jumi Kang (violin). In accordance with the established tradition the recording will be done with the participation of German sound engineer and producer Philipp Nedel, a Grammy and ECHO award winner, a constant partner of such recorded music companies as Decca, Deutsche Grammophon, EMI, Sony Music and Onyx. In 2015-2017 Nedel and his company b-sharp took part in the NPR's release under Sony Music's label of an album of Edvard Grieg's music “A Wounded Heart” (it can be heard in the “Audio Section), as well as in the recordings of Taneyev's “John of Damascus” Cantata (see “Sacred Russia”), Tchaikovsky's Sixth Symphony and “Eugene Onegin” and other music.